Labour Card Scholarship 2018 Labour Welfare Organization issued online application for 10th 12th School Students who is children of Beedi Workers, Mine Workers and Cine workers. Scholarship to Labour worker children’s transfer to bank account in the name of school where their children studied and Labour Scholarship from every year gated in the month of July-August which ends after Mahatma Gandhi Jayanti. Beedi scholarship application form 2017-18:- Central Government has introduced Beedi Workers Children Welfare Scheme by allotting through financial assistance. It mandatory to all beedi workers should sign up with Ministry of Labour Department Yojana that grants social justice to live what they love to do. Government has shake hand with Employee Provident Fund Organization to workers. Need Based Scholarship List 2018 to Meritorious and Needy Students? Labour Scholarship Scheme for Mine Workers Children: - Ministry of Labor and Employment invited form from Mine Workers Children’s to complete their education and make career in higher studies. Selection process of scholarship mine works should belong to Iron ore, Manganese Ore & Chrome Ore Mine (IOMC) workers, Limestone & Dolomite and Cine workers. Labour Students Scholarship Scheme 2018:- On yearly basis Government increase wage of Labour and also scholarships. Day by day due to increase inflation in Food, Home and needy things government perform various steps to defeat inflammation from the method on increasing salary, Wage and giving such scheme to help livelihood. Ministry of Labour and Employment Pre and Post Matric Scholarship 2018:- Parents of Children Labour Workers only financial assistant awarded if they read in Government recognized school. At prescribed rate limited amount up to Rs 15,000 awarded to workers who have given service 6 months or extra. Shram Kalyan Scholarship: - The Girls and Boys have passed in first attempt to last qualifying exams. Candidates should have passed with regular studies from recognized state and University by any medium. c) Cine workers – Minimum Lumsump 1 Lakh amount transfer to Cine Worker school is paid monthly 8,000/- per month. Selection Process: - Candidates should belong to Beedi Workers, Iron and Manganese Ore, Chrome Ore Mine (IOMC) workers, Limestone & Dolomite Mine (LSDM) workers and Cine workers. Educational Qualification: - The degree taken through Correspondence is not eligible for scholarship. Students who are receiving other benefit on financial basis or will not be carried out in this scholarship scheme. Labor Scholarship Bank Account: - Parents have both option to open with labour scholarship or separate bank but name of scholarship holder should be on top. How can you apply: - Interested and eligible candidates should apply or visit directly to Labour department office available in all India. 1. 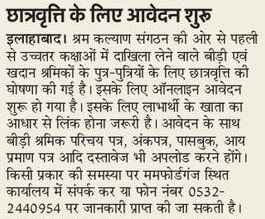 Existing users needs to register with new document of Caste, Income and High school and Intermediate certificate. 2. Upload the essential documents and submit the form. Opening Date Labor Scholarship Registration: - 20 July 2018. Last Date for Labor PRE-Matric Scholarship IS 30 September 2018. Closing Date FOR Post Matric IS 31 October 2018. Documents required: - Verification and Labor scholarship renewal conducted every year with improvement on cash given to scholarship holders.